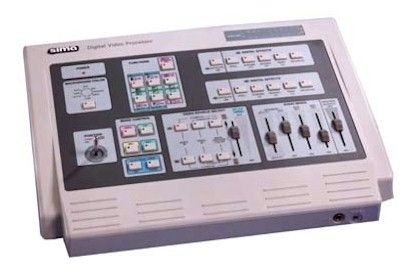 For professional-quality mixing results without professional studio prices, try the Sima Digital Video Effects Mixer. Digital signal processing maintains the integrity of video signals keeping down "noise" while producing vibrant colors and crystal clear picture quality. Digital effects - Use strobe, mosaic, paint, still and negative effects to maximize the impact of your images on both A and B channels. Select the size and position of special effects areas with joystick accuracy. Picture in Picture - Create PIP windows and use the joystick to move location on the screen. The joystick moves PIP windows to any location. Wide range of wipe patterns - Circle, bar, cross-hatch, corner and wedge wipes along with fade to black and fade to white effects. You can pre-set the speed of wipes and fades for one-touch automatic control. Chroma Key and Luma Key - Use the chroma key (blue screen) or the luminance key (black screen) to isolate images and superimpose onto other scenes. 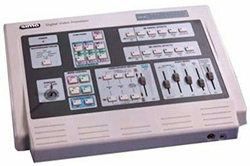 Four inputs - two audio/video inputs and two s-video inputs give editorial flexibility and increase options.